Enjoy a taste of Italy visiting its three great cities Rome, Florence, Venice. 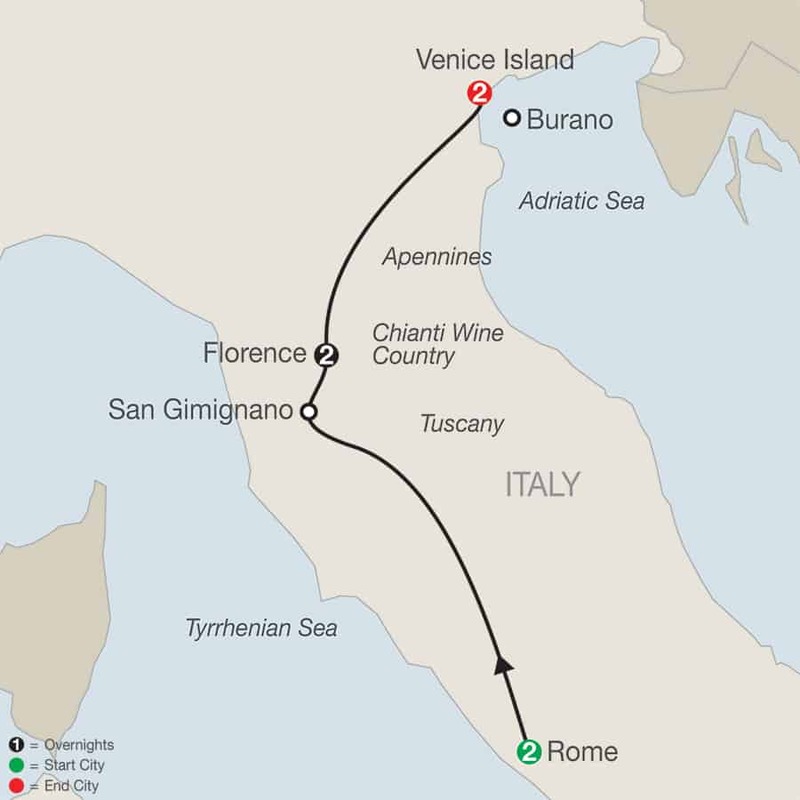 This 8-day escorted Italy tour travels by luxury motor coach between cities. And you’ll skip the lines at all the sightseeing highlights including the Vatican Museum, Ancient Roman Forum and Colosseum, the Accademia Museum in Florence, and Doge’s Palace and St Mark’s Basilica in Venice. The tour includes 4-star accommodations, breakfast daily, one dinner in a Roman trattoria and a lunch in Tuscany. There is an option to extend the tour with three nights in Lake Como. For the daily trip itinerary click here. For informational about additional optional tours scheduled during what is otherwise free time click here. To book your Rome, Florence, Venice tour and for more information about the price with airfare from your preferred departure city submit the form. Rome – Enjoy authentic dinner at a local Roman trattoria. Florence – Guided walking tour of the historic center including a visit to the Accademia Museum to see Michelangelo’s David. 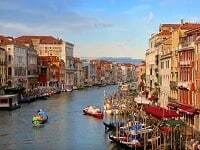 Venice – Guided walking tour of St. Mark’s Square, The Doge’s Palace and Bridge of Sighs. Venice – Visit Caffe Florian and enjoy a drink on us. 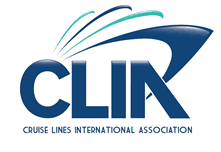 Transportation between cities by luxury air-conditioned motor coach with Wi-fi. An expert Tour Director who travels with you from beginning to ending. For the daily trip itinerary click here. Rome Hotel Best Western Universo is located in Rome’s center is within 10 minutes of walk of Rome’s sightseeing highlights. Florence Hotel Adler Cavalieri is located in Florence’s center convenient location for sightseeing in Florence. Located on the Grand Canal in the center of Venice in St Mark’s Square this hotel is perfect location to enjoy Venice sightseeing. This modern hotel is just steps away from the shores of Lake Como and overlooks Piazza Cavour. The following optional tours are available during what is otherwise free time and are not included in the tour price. To make the most out of your stay join the Local Guide for a tailor-made itinerary featuring some of the city’s authentic jewels. With our optional walking tour, you will have the chance to see the famous Spanish Steps, the Trevi Fountain, Pantheon, Piazza Navona and more Roman sites and squares. Click Rome sightseeing highlights for information about strolling around Rome. With your Local Guide, visit one of the earliest museums in modern Europe with the world’s finest collection of Italian and Florentine art. Gain fascinating insight into paintings by the great Masters Giotto, Botticelli, Leonardo da Vinci, Michelangelo, Raphael, and Titian. Tuscany is known for its gorgeous landscapes, its rich traditions, long history, and culture but Tuscany still has more to offer with its great food and wine. Tonight enjoy a traditional Tuscan meal with regional dishes prepared using the finest local ingredients. Taste four mouth-watering courses of local specialties at a fine Venetian restaurant. After dinner, time to explore and absorb the unique, romantic atmosphere of Venice by night. Enjoy a ride in a traditional gondola, gliding through centuries-old canals, under famous arched bridges, past lavish palaces, and quaint piazzas. These long, narrow, flat-bottomed boats with a high prow and stern were designed specifically for the Venetian canals and made in unique shipyards called Squero. Black is the obligatory color, due to a law passed to reduce how the rich and noble over-decorated their personal craft. The comb at the front of the gondola is made of iron and serves not only to balance the boat but is also the symbol of gondolas and Venice. The six comb teeth represent the six Venetian districts sestieri. Note: the gondola is to be shared with other guests (maximum 6 participants on each gondola). There will be one musician onboard one of the gondola boats in your fleet. Appreciate the peaceful vistas of the Lagoon while you glide past the islands of Santa Elena, San Michele, and the famous Lido. On picturesque Burano island, renowned for its lace making and colorful houses, savor a mouth-watering meal, with drinks included. Afterward there’s time to shop and stroll. To book and for more information check the box next to the Rome, Florence, Venice tour that you would like to join and submit the form. After your overnight flight from the United States, you’ll arrive in Rome. Check-in to your hotel and relax. Maybe take a stroll around the beautiful city. This evening you’ll meet your tour director and join fellow travelers for an evening of fun and delicious food at a local Roman trattoria. 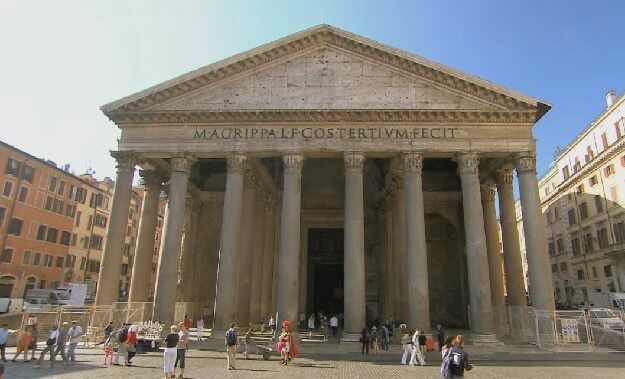 Today you’ll tour Rome’s sightseeing highlights. The day begins in Vatican City where you’ll tour the Vatican Museum including the Sistine Chapel. The museum is full of the world’s finest and largest collection spanning thousands of years. After you’ll visit St. Peter’s Square and St. Peter’s Basilica. Then you’ll cross the Tiber River to see the Colosseum and see the Ancient Roman Forum. Then you have time to explore Rome on your own. You may also join the optional walking tour of Rome’s piazzas, including the Spanish Steps, Trevi Fountain, the Pantheon, Piazza Navona, and more. This morning your tour continues from Rome through the hills of Umbria to Tuscany. On your way to San Gimignano, the medieval hilltop town with its tower houses, enjoy lunch and wine tasting. Then, you have time to walk through San Gimignano’s historic center, a UNESCO World Heritage Site. After your tour continues on to Florence, “Cradle of the Renaissance.” Upon arrival, you’ll check in and then have free time to enjoy Florence. This morning you’ll be escorted around Florence and its historic center by a local expert Florence tour guide. You’ll visit the Accademia Museum to see Michelangelo’s David. You’ll also see the Duomo and Brunelleschi’s Dome, Giotto’s Bell Tower, The Baptistry and its bronze doors adorned with a bas-relief by Ghiberti, Signoria Square and the famous Ponte Vecchio bridge over the Arno River. This afternoon you have time to explore Florence. Today you’ll enjoy a gorgeous ride from Tuscany, through the Emilia Romagna region and across the Apennine Hills to Venice. Upon arrival in Venice, you’ll transfer from motor coach to private boat. You’ll cruise down Venice’s canals to St Mark’s Square. There a local expert Venice tour guide will guide you a walking tour of Venice’s sightseeing highlights. You’ll visit St. Mark’s Basilica, The Doge’s Palace and the Bridge of Sighs. You’ll also visit an artisan’s workshop to see glassblowing. Today you have lots of free time stroll around Venice and get lost among its alleyways. You may also join an optional tour the island of Burano. This afternoon we’ll treat you to an aperitif at Caffe Florian. Then you have time for a final dinner. Your vacation ends with breakfast this morning or add three nights to the Rome, Florence, Venice vacation to visit Northern Italy’s Lake Como. 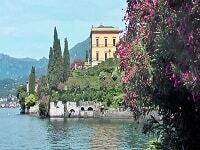 Travel by high speed train to Milan, then transfer to beautiful Lake Como. Enjoy a guided walking tour in charming Como, which includes the historic center and the imposing, marble-clad Duomo. Your Local Host can help you make the most of your stay. Day at leisure in Como. You may want to take the ferry to the various towns on Lake Como including Mennagio, Verrana, and more. You will also have Local Host will have many suggestions for your day at leisure. 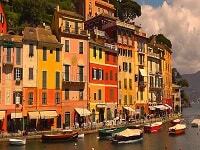 Click Rome, Florence, Venice tours to view all the Italy vacations to these great Italian cities.